I spoke at the Bureau Valley Clinic on Saturday, February 7th. After putting everything I had into over three hours of track & field presentations I could barely stay awake on the drive home. My original plan of participating in an all-day Douglas Heel Seminar on Sunday was becoming highly unlikely. As the night wore on, I had decided I was going to respect the Sabbath and take time to rest, recover, and recharge. I woke up at 8:15 on Sunday, February 8th, without an alarm. At 8:30, I was in the car heading to see Douglas Heel. Sometimes an inner voice tells me to get up. Sometimes it tells me to show up. I heard both things on that Sunday morning. Sunday, February 8th, turned into a day to remember. I was activated and did activations from 9:00 until 6:00. Six days later, I went to Douglas Heel’s Level-2 Seminar. Twelve consecutive days of work coinciding with the start of my track season, teaching Stoichiometry (predicting and measuring products of chemical reactions), and keeping up with my expanding Twitter universe could not keep me away from another 20 hours with the Zen-Master Physio from Cape Town. I’ve spent 50 hours with Doug since last October and I look forward to his return this summer. By the way, “physio” comes from Greek roots meaning nature, natural, physical. The description of Be-Activated is a challenge. Nature, natural, physical is a good start. What do you do when your computer freezes? You reboot. Be-Activated is, in a sense, the rebooting of the body to return is to its original natural physiology. Activation attempts to return to a 1-2-3 firing pattern, with “1” being the diaphragm, psoas (hip fexor) and glutes. “2” being the abdominals and thighs, “3” being the head, arms, and lower legs. Picture 1-2-3 firing as an explosion, KABOOM. 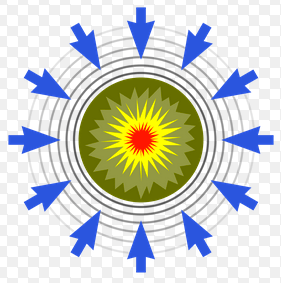 Force is generated from the center, outward. All athletes want to be “explosive”. We all live with 14.7 pounds pressing on every square in of our body every minute of every day. In addition, life is hard. The stressors of life … fear, failure, doubt, negativity, anger, hatred, jealousy, rejection, greed, sadness, insecurity, etc. will all impact physiology. The crap that people deal with every day causes an over-active sympathetic (adrenaline) response of fight, flight, or freeze. Instead of an explosive physicality, stressed people implode. The implosion is physical, but the brain is in charge. In an attempt to protect itself, the body collapses to defend the vital organs of the chest and gut. Shoulders rotate inward, the rib cage collapses, breathing becomes shallow, and the spine slumps forward. How do people combat this collapse? Some people try to escape by drinking, prescription drugs, or self-medicating with whatever is available. “Be-Activated” gets it right as well. Treating the body’s operating systems (chemical, electrical, and structural) as a single ecosystem is not a simple task, but it can be done. Cortisol coming from the adrenals in times of stress cause the production of belly fat. As the Paul Simon song goes, “Why am I so soft in the middle when the rest of my life is so hard?”. Conventional wisdom tells us to fight the soft belly by working on core strength. Crunches by the hundreds will create strong abs but will further collapse and deactivate zone-1 (diaphragm, psoas, glutes). Sadly, many weight room activities facilitate implosion. Do athletes get stronger? Yes, of course. Muscles grow bigger and more weight can be lifted. However, do weight lifting gains translate to better performance? Do bigger muscles prevent injury? Yikes. In my opinion, despite modern science, professional athletes are more injury prone than athletes from the previous generation. Weight training and steroids have created bigger, stronger, and faster athletes. Are they more durable? Hell no. How does the enlightened person combat this collapse? Douglas Heel teaches diaphragm activation, psoas activation, glute activation, and a focus on belly-breathing. This is central to “Be-Activated”. There is much much more, but the priority must be zone-1. All movement begins with the diaphragm, psoas, and glutes working in perfect unison. Without zone-1 activation, the body finds other ways to move. Performance will deteriorate. Strange compensation patterns will become habit. Injury will result from unrealistic workloads being placed on individual links of the kinetic chain. The adrenaline-fed, over-stressed, tunnel-visioned brain has impacted patterns of movement. The mind-body-spirit thing is in a bad place. There is implosion. I can hear it now. “This is just another example of the “pussification” of America.” Real men train like Navy Seals. Zen Buddhists don’t play football or run track. Real men can bench press twice their weight. Real men grind their bodies in the weight room until arms and legs are dysfunctional. No pain no gain. Pain is just weakness leaving the body. Old-school coaches are entrenched in the mindless pursuit of physical and mental toughness. Old-school coaches are unbalanced and broken. You know exactly what I’m talking about. Every athlete has played for a tyrannical coach sometime in his career. If you haven’t, you must have quit sports at an early age like most American kids. Healthy explosive athletes who are in the zone will always out-perform imploded athletes lacking awareness and focus. Empowering athletes is not some new-age mystical philosophy of losing coaches. The Seattle Seahawks have adopted a new school approach to football. The article linked here talks about many of the topics included in Be-Activated. The Seattle Seahawks aren’t the only Zen-football team in the U.S. In college football you have the innovative Oregon whose coaching staff does not believe in yelling. Could there be a correlation between the parasympathetic (calmness, sureness, awareness) and winning? Could the absence of fear, stress, and physical implosion be a performance enhancer? Ha. I love quotes. Douglas dropped this one on us, “I want to know if you will stand in the center of the fire with me and not shrink back.” I immediately wanted to know the source, so Doug read the entire poem, “An Invitation”, by Oriah Mountain Dreamer. Be-Activated can be an emotional and powerful thing. Those who have not read my previous articles should be aware that THREE “Be-Activated” teams have won Illinois state championships in the past year. York (track), Hinsdale Central (cross country), and Nazareth (football) are all members of the club. Did you notice that Downers Grove South won the 20-team Proviso West Invitational last Saturday? 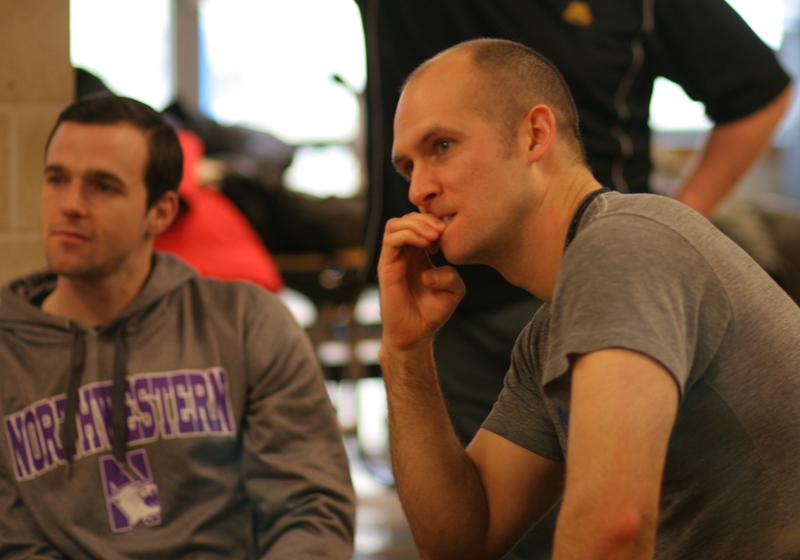 Is it a coincidence that Coach Dustin Hausherr of Downers Grove South attended 40 hours of activation seminars in the month of February? 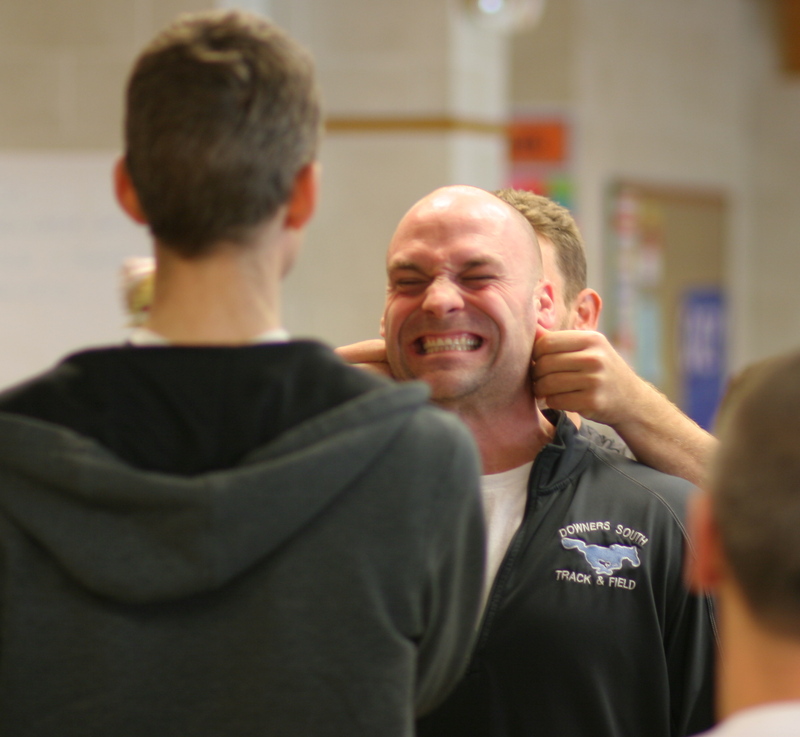 Coach Hausherr is a tough coach but the jaw line is very sensitive. Click to enlarge. Manual therapy has been around for thousands of years. Check out Active Release Technique (ART) and “Muscle Activation Technique” (MAT). Both are costly patented business models but both involve manual therapy. Check out the work being done at the World Athletics Center in Phoenix, AZ. I keep seeing twitter posts about “Performance Therapy” for track & field athletes. 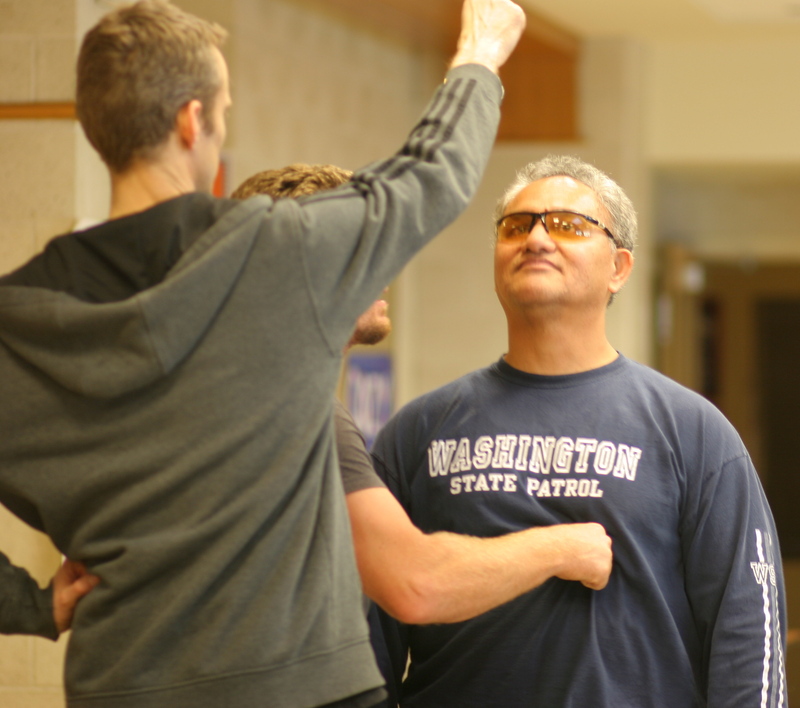 “Be-Activated” is another hands-on approach to performance enhancement. Douglas Heel makes it very clear that his program is nothing like the others. In addition, Heel does not “sell” his program for thousands of dollars. ART certification costs $11,000. MAT costs $11,500. I would consider ART and MAT alternative medicine. “Be-Activated” focuses on injury prevention and performance enhancement and you won’t have to re-mortgage your house or take out a college loan to learn it. I get this question all the time, “How would I implement Be-Activated in a team setting?”. I am lucky because I spent several days in November observing the Nazareth football program. I described what Nazareth did in detail when I wrote 3 Reasons Why Activation is a Game Changer. Nazareth had the total buy-in by their head coach, Tim Racki. They also had an activation expert in Dr. Tom Nelson. Nazareth has been doing activation for three years, so their activation evolution is more advanced than any school in the country. A coach wishing to implement activation should begin by getting activated personally. Find someone on the list at the end of this article and experience activation for yourself. Next, you need to attend a Douglas Heel Seminar. I wrote this after my first seminar, You Only Know What You Know. Douglas will not return to the United States until this summer. Your only option for this season is to learn “Zone-1 Activation” from a practitioner and then pass it on to your athletes. Activate the diaphragm by running the thumb down the center of the sternum. Work on areas that are most sensitive. Yes, this really hurts. The whole process takes about two excruciating minutes. When finished, the body responds with an incredible belly-breath. Next activate the psoas. In the photos below, Nazareth football star Julian Love is using an activation stick to activate his psoas. The stick is used for self-activation, otherwise it’s done with the thumb. The spot is two inches to the side and two inches down from the naval. The pressure should be up and in towards the naval as 15 belly breaths are taken. By the way, activation sticks can be purchased from Dr. Tom Nelson who is on this list at the end of this article. Click to enlarge. This goes pretty deep. Moderate touch does not do the trick. Next activate the glutes by rubbing the bony ridges at the back of the head 15 times on each side . Then rub the jaw line below the ear. This can be very sensitive. Open the jaw wide when finished. Belly breathing must be done during the entire activation. This is very painful but temporary. Despite the pain, I have yet to witness a kid who doesn’t want activated. The pain stops when you stop. Click to enlarge. Diaphragm breathing is the key to the entire zone-1 activation. With sticks, athletes can take care of their own activation. Zone-1 was a daily exercise during warmups at Nazareth. Don’t get the wrong idea, there is much more to activation than the simple self-activation of zone-1 described above. I’ve attended 50 hours of instruction and look forward to more this summer. My three sons are all now in their 20’s. I wish they would have had access to “Be-Activated” when they were athletes. Alec had a “tight hamstring” his senior year that kept him from repeating as a state medalist in the hurdles. Troy had ankle and shoulder problems that plagued his entire senior year in football and track. Quinn had two shoulder surgeries and hamstring tightness in high school. Injuries led to a disappointing high school career. I am certain that activation would have made a huge difference in their experience. In athletics, there are no do-overs. Losing is a part of coaching that I accept. I’ve lost as much as I have won. Injuries, especially long-term unexplained soft-tissue injuries, drive me crazy. When I see an all-stater who will not be an all-stater because his hamstring is “tight”, I struggle. Recently I was explaining activation to my father and he looked at me like I’d gone off the deep end. The list above includes only a small percentage of the practitioners of “Be-Activated”. If there is anyone out there who would like to be added to this list, contact me at tony.holler@yahoo.com or 630-849-8294. I can add/subtract or edit this list at any time in the future. I really don’t know how to weave the following into a smooth, even-flowing narrative, so I will simply let it flow as it flows. I asked several people on the list above for their thoughts and stories about activation and here are some of their replies. Be-Activated has changed the training & life for students at Bartlett. In November after my first activation training we had a two day a week muscle activation education training. We started with diaphragm breathing to zone 1 to zone 2. In our education each athlete found out their body’s sequence for movement. Each athlete has different activation points after zone 2 depending on their sequence. It started out as something weird and now I’m being asked everyday by a new athlete/student/faculty to help fix what is wrong with their body. It has come to the point where my door is open for anyone needing activation. It has helped to unlock kids who had shoulder pain that physical therapy could not heal, lower back tightness that two years of physical therapy could not fix, and ankle & knee pain that wouldn’t go away. Shin splints are becoming extinct at Bartlett High School. Most of these issues just needed diaphragm breathing and zone-1 activation; while others needed specific zone-2 activation. At our track and field practice, activation of diaphragm followed by 10 belly breaths and zone-1 activation is our staple. From there, athletes will get zone-2 or zone-3 activation for what is sore, stiff, or painful. Athletes know what to do because of our activation education in November. Thanks to Dr. Tom Nelson, we have a supply of activation sticks that athletes will use on themselves between sprints in our workouts or come by during the day to use before going to their next class. It is becoming a culture at Bartlett High School to be activated all day, everyday. Our track season has had it’s best start performance-wise. Our athletes believe in Be-Activated and the visualization that comes with it. On a personal level I activated myself for about three weeks straight and then took one week off to see if there were any differences with my body and mind. I had more stress hanging around in my body and mind when I was not activated, I had less patience and my body was in pain from normal everyday activity that I dd not have before and my concentration was short during the day. I am addicted to Be-Activated because my life is more enjoyable, I am a better person and am more positive which helps me be a better husband, father, friend, teacher and coach. On top of that I feel fresh everyday because I start and end each day with activation. I was thinking that a potential topic of one of your articles could be how all of us who do activation have to resolve our issues first, in order to be able to help other people. If you listen to people, they go pretty much on the same path; the first time you take a workshop everything you knew falls apart, but you know what you just heard makes sense and you can’t continue the old ways anymore. Then, as you start putting things together, you need to unpeel your own onion with your own issues in order to continue. You do activations on people, have them done on yourself and get stronger in the process. Then it becomes quite a journey. You don’t see your struggles as struggles anymore. You see them as a path that was meant for you and challenges you need to overcome and you never again look at things the same way. What you perceived as struggles are just things that needed to happen in your life, in order to make you stronger. Your relationships improve and you learn how to appreciate yourself more. As you appreciate yourself more, people appreciate you more. What I am trying to say is that once you take a Douglas workshop, it stays with you for life and every aspect in your life changes, whether you know it or not. You know you have a journey and you don’t struggle anymore. You have the tools to overcome difficulties and you are true to yourself in the process, so you get to know yourself a lot better too. Patton Segraves (coach at Belleville West) has been bringing his sprinters over to my house at least once a week. I plan on taking level-2 this summer. To the left is Matt Smith of Northwestern Medical Group. To the right is Dr. Nate Porcher of Arlington Heights. Nate was a college track athlete and presently works with athletes at Palatine Fremd and Prospect. Here Nate was super-nervous thinking he would be Doug Heel’s next subject. Click to enlarge. We have started with the basics and will slowly progress throughout the season. This will allow me the chance to practice and master the next levels of activation before I teach and instruct my athletes with them. One thing I have already noticed after implementing the activation exercises this season is that I have had very few injuries up to this point, including the ever-so-common shin splints. My athletes times are improving as they are finishing races better than I have ever seen within my five years of coaching track. They come to practice and meets more focused due to the fact that they just feel better and have more energy than they ever had before. The progress is overwhelming and it shows on the roster as we have had an increase in the number of sprinters and overall athletes join the team. Not a single athlete has dropped out. Not only are their times getting faster, but I also feel as if they are coming closer as a team. As each athlete activates the other, they are developing this sort of mutual respect and trust for one another. I have witnessed them motivating and encouraging each other throughout the process. 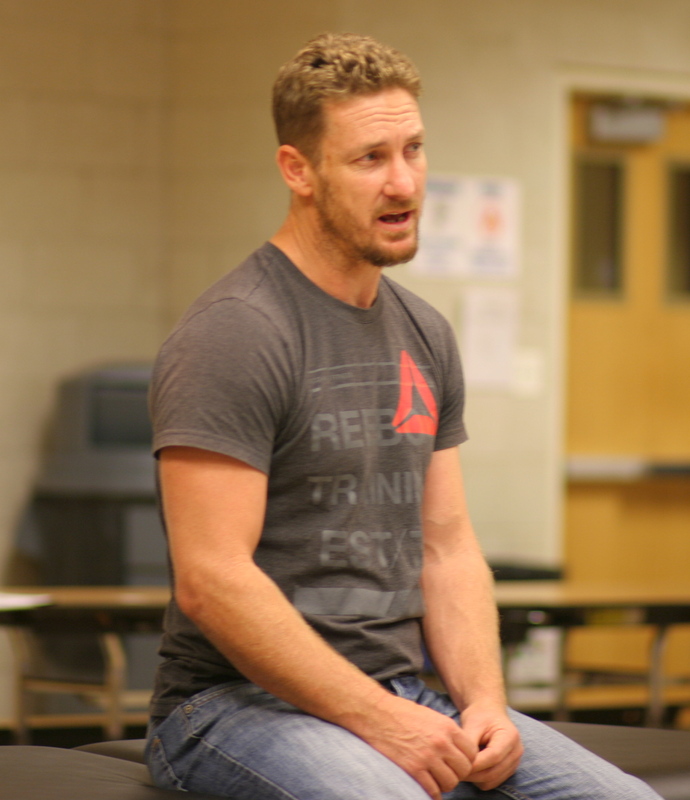 I have also adapted your philosophy of “ less is more.” I have not only started to give my athletes more time for recovery and rest, but I have also instructed and taught them the right ways to recover and the importance of proper nutrition and hydration. As a coach, activation has given me a completely different perspective and enthusiasm that my athletes can see. My athletes trust in me to coach them up and understand that I will do whatever is best for them not just as an athlete, but as a person. Athletes from other sports have also grown an interest in our training. I am receiving more questions and positive feedback about your unique training methods based on our impressive results so far this season. This has allowed me to promote our sport to other athletes and has encouraged them to participate in multiple sports during their high school careers. I am a family medicine physician in Sandwich and work with Dr. Eric Janota. I use activation every day in my office. My referrals to physical therapists has decreased drastically. My perspective from the activation workshop is that I do it to gain knowledge, not just about activation but about myself. My wife, children, and staff at the office can definitely tell when I’ve attended a workshop and spent time with Douglas. On average, I am seeing about 4 fewer patients per day but I am so much happier in my work. My powers of perception have increased and the more I do activation the more intuitive I become. I catch myself smiling when a patient is telling me about their terrible shoulder or hip or back pain because the more I let them talk , the more they confirm the pattern for me. Then they are amazed that I seem to know exactly what to do even though I am working far away from their affected body part. This process has changed my life and my plans for retirement from medicine. I love working with the truly motivated athlete because they focus on the gain rather than the pain. In just 2 short weeks our kids are all-in on activation. It’s strange seeing 14-18 year old squirrelly boys focusing and doing their breathing exercises. They believe because they can feel the effects. I literally have not had a practice where a kid has not asked for some activation work. Here is the best part, they are learning to do it for themselves. I would love to be able to connect with other folks who have also experience the Be-Activated classes. For one, I would like to see if there is a time and place for some of us to meet up and possibly practice some of the testing and activations on each other… sort of a follow-up seminar or mini-class. I am making my best attempt at implementing some activation practices with our track team, but there is always the personal concern that I am missing out on something. Practicing with others who might be in the same situation would be awesome if possible! The Be-Activated program is by far the best course I’ve taken on how to improve sports performance and movement, period. By the way, did activation last night on a one of my athletes at the WA State Regional Playoffs. She is the #1-rated point guard her in the Northwest and 1 of 2 All-American’s from Washington. Had an audience of coaches, parents and athletes oohing and aahing throughout the process. Picked up 5 new clients with requests to visit 2 other programs in 15 minutes of activation and questions before the game. Talk about a captive audience! It’s been mentioned in the late 1990’s through Dr. Donald Chu’s work that plyometric training is the bridge that connects strength training and athleticism. If that’s case, Douglas Heel’s Be-Activated is the key to unlock that bridge. Without it, athletes would still faced with compensation issues leading to more injuries. Coach Ava of Hawaii (Athletic Edge Performance) getting vision field testing done. Coach Ava attended both seminars in February. Click to enlarge. I am lucky because I get to see Korfist at work everyday. I get to ask him questions and get further explanation on things, I couldn’t ask for a better situation. I am extremely lucky and I am grateful for the opportunity. I have been a believer in activation since I started here at Montini. Coach Connelly (went to level-2 last weekend) was using it on the girls and I saw what it could do. I was so excited to see it in action at the Heel Clinic and to experience it for myself. The kids have taken to it so well and want to learn. Our football “track guys” are disappointed in their teammates that opted out of joining this year. I have baseball kids begging to train with us before their season starts. There is definitely a buzz about track in the halls of Montini. I’ve been following this work for just over a year now, since Pete Wintermute (my head coach) first took the Level-1 Seminar and began to implement it with our team last track season. I’m a part-time volunteer for track, so I wasn’t there when it was introduced and taught to the girls, but I did see it in action after that. I was impressed. For cross country, I am the assistant coach and really wished then that I had the background/training, as I didn’t feel comfortable practicing it without having the full understanding. I did start seeing Dr. Nate Porcher (did Level-1 twice and most recently Level-2) in the fall for my hip issues (many) and he activated me and kept me running all season under some lousy conditions. I was really excited to finally get to do the training myself, already having been watching it work with my runners for about a year, then being activated myself in the fall and feeling the effects in my own body. The training was even better than I had hoped for, and I had very high expectations going in. The bottom line is that I feel absolutely empowered by what I learned from Doug Heel. I feel like I’m now in a unique position to help others. As I said earlier. If there is anyone doing activation who wants to join the list in published in this article, just email me at tony.holler@yahoo.com. I can also add/subtract/edit. My goal is to make track and field a better sport where we maximize the performance and experience of every kid. That’s all. Ha. “I want to remind us all that the world is listening, all the time. How we are ripples out from us into the world and affects others. We have a responsibility, an ability to respond to the world. Finding our particular way of living this responsibility, of offering who we are to the world, is why we are here.” From “The Call” by Oriah Mountain Dreamer. 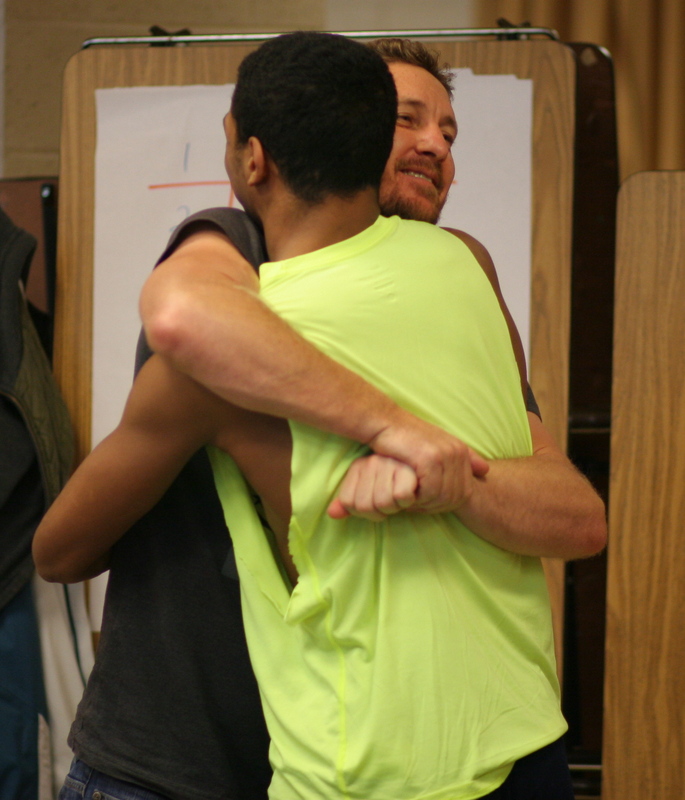 Douglas Heel saying goodbye to Julian Love. Click to enlarge. Hi Tony – Thanks for writing these articles, it served as great motivation for me to travel to see Douglas in person. Recently wrote an article about my personal experience and Babson College’s start of Activation work – will follow it up with a part II. Thanks for sharing your experience. It’s fun to be on the ground floor of something so empowering. I tweeted your article from @pntrack … hope others will take the time to read it. Hey Tony! I really enjoyed this article. As a High School and Division I Track & Field Athlete it is truly remarkable how logical and effective the Be-Activated techniques are. It changed the way I competed and now teach the sport of Track & Field. I have attended two Level 1 seminars, and one Level II seminar. The physical changes I have felt and tools I have to help others to improve and re-vamp mechanics to an explosive 123 sequence are amazingly effective. For years I have devoted most of my attention to proper mechanics, assuming it was the silver bullet to athletic success. Without a doubt it is a major factor, and certainly could be more or less important to any individual athlete. But i’m learning that the “mind body” factor is much more closely related to athletic success that I previously realized. Though I continue to work closely with mechanics training, I thought i’d share my recent experience with how much the mind can effect the body as well. I also had them take 5 belly breaths and say “I’m the greatest” 10 times out loud, then take off. Before friends can make jokes, before closed down posture returns, and before they can start worrying about whatever was previously stressing them out or depriving them of confidence. This is a technique Chris Korfist showed me where I had previously seen athletes add 2-3 inches to measured vertical jumps. On the sprinters’ last fly-10, 17 out of 24 sprinters ran their fastest time of the day, the vast majority of those 17 were personal bests for the athlete. Saying something 10 times wont permanently instill confidence and eliminate stress, but many of my athletes were absolutely jaw dropped after looking at their times (Learning what they “Dont Know They Dont Know”). Along with our training I hope our sprinters begin to realize how much they can continue to improve from a combination of physical mechanics and the realization that the mind ultimately effects how the body performs. For some, the physical feeling of being activated provides a needed sense of confidence. For others, belly breathing, a power stance, or something to reassure confidence can also make an enormous difference. Very cool stuff, thanks sharing your article! The link to the TED talk is below if my embed video didn’t work. Thanks!